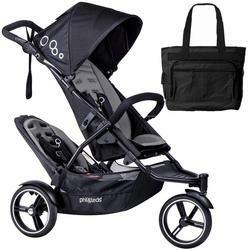 Peg Perego Primo Viaggio SIP 30. As a compact&metro ready inline buggy for both new and growing families, its easy to see why dot is turning the heads of inner city parents. At just 23" slim & weighing in at just 26lbs, dot is our most compact inline stroller, yet has a full sized seat! compact metro ready, dot helps you maneuver with ease through the tight metro squeeze. At just 23" slim, dot glides through narrow doorways tight city spaces with ease. phil teds clever engineering makes popping up over curbs a breeze. set the front wheel straight for rougher terrain, or pop it in swivel mode to navigate the city. ultra light handling at it’s best. With double kit included, dot offers even more options for 1 or 2 kids. 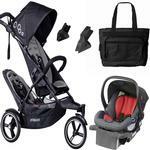 use dot double kit as a parent facing seat with 1 baby on board. when 2nd baby arrives, get inline! 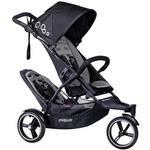 both your little ones are good to go with the double kit attached to the front or rear. Perfect for small car trunks! for complete super-parenting powers, dot has a light easy, 1 hand auto-locking compact fold at only 23.2" slim. taa-dah! NZ-designed aerotech wheels offer the smoothest ‘air tire’ ride without the air - fancy that? ride over all terrain in cushioned comfort, be confident that you’ll have no flat tires.